Northern Ireland striker Steve Jones is to leave Crewe, following their relegation from the Championship. The 29-year-old is out of contract this summer and has expressed a desire to move on but boss Dario Gradi will offer him a new deal if he changes his mind. However, the Alex boss has decided to release seven other players. Richard Walker, Anthony Tonkin, Justin Cochrane, Adie Moses, Kyle Wilson, Andrew Bond and Alex Morris will not be offered new terms. Gradi is also prepared to allow striker Pavol Suhaj to leave on a free transfer. 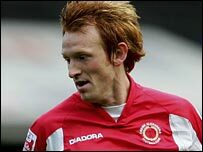 Jones has scored 45 league and cup goals in 173 appearances for Crewe since signing from Leigh RMI in 2001. He has won 19 full international caps for Northern Ireland, scoring once.